Set in an old-school independent bookies in a declining Scottish town, "Odds and Sods" allows us to spend a day in the company of owner Sandy, ditzy cashier Janice and a number of their regulars. Writing team Tom Brogan and Fraser Campbell have made a considerable effort to flesh out each of the characters giving them distinct personalities and their own microplays within the bigger framework. In many ways, with its running time of 2 hours (including a 15 minute interval) it's like watching four episodes of a new sitcom back to back. It would work well in that format, but as a single piece of work many of the short tangential moments that develop the characters seem indulgently overlong and too frequent. While having two or three such set pieces or subplots would add to the whole, by my count here we were into double figures and it does impact on the pace of the show. Comedy wise I need to be up front and say that the style of humour isn't one that greatly appeals to me. I like a more subtle approach than the broad and physical comedy that generates most of the laughs here. But it was clearly well crafted and executed and was very much to the liking of many in the audience. And there were enough nice one liners to give me a fair few chuckles. After the interval there is a noticeable change in tone and the comedy is a little less 'in-yer-face', taking a back seat to the characters and our central interest in whether long-time loser Shug's accumulator is about to break the bookies. The shift isn't seismic and sits comfortably on the foundations built in the first half but clearly shows the writers are equally at home with the 'manic' level dialled down a little. The cast all do well, and the few stumbled lines are understandable given the wordiness of the script and the pace and energy the delivery often requires. 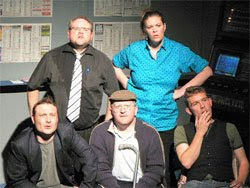 James Keenan makes Sandy suitably obnoxious as he battles with John Love's hard done by Shug while Moira Byrne's Janice, Will Speirs' scam artist Milton and Christopher McKiddie's washed-up pop star Jordon make the most of playing up the comedy. Robert Radcliffe and Jennifer Byrne as Frank and Shelagh on the other hand play their roles pretty straight and succeed in giving the characters a real level of depth. Brogan and Campbell also combine to provide assured direction with some nice touches in handling the commentary of the sporting events. If they can pitch this setting and these characters as a sitcom format then I’m certain there would be an audience for it – but I’m just not sure I’d be one of them. This was my first visit to the Ramshorn Theatre and it’s a lovely building, although the legroom in the seats leaves much to be desired. The theatre is currently campaigning to safeguard its future and I’d hope there's a positive outcome. It’s a great space in a fantastic location that should be looking to expand its activities - not having to worry about its future. Odds and Sods from You Owe Me Glue and Strathclyde Theatre Group runs until 17th October. Image by Susan Triesman used with permission.